Audio. Anywhere. Weatherproof loudspeakers, amplifiers. …stadium audio, marine audio, mountain audio, and more. Mobile Audio and Permanent Installation Systems. The world’s best outdoor audio gear – made in Massachusetts since 1995. » See Customer Comments and Videos! » Why Technomad? Audio Systems – Stadium, mobile, restaurant/retail. New! DragonFly – world’s first weatherproof, portable full-range PA system. 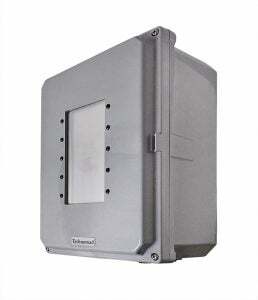 Weatherproof Loudspeakers & subwoofers – Unmatched audio quality, IP56 / Mil-Spec 810F. Technomad loudspeakers – weatherproof speakers and outdoor loudspeakers, as well as waterproof sports PA systems, IP66 waterproof outdoor amplifiers, and mp3 player/recorders with automatic mp3 playback. Since 1994 Technomad has been manufacturing high-fidelity, IP56 weatherproof loudspeakers and rugged, reliable outdoor speaker systems for a wide range of clients. Proprietary weatherproofing and rainproof technology is combined with military-specification enclosures and first-rate loudspeaker drivers to produce best in class solutions for outdoor sound reinforcement, military sound, school, university, cruise ship and touring sound applications. Technomad weathertech rain-proof 3 layer grills provide an unmatched solution for high quality outdoor audio that resists rain, snow, precipitation, insects and other sources of loudspeaker and speaker damage. Rugged, reliable, and tough loudspeakers from Technomad are used around the world in install and mobile applications … call us with your difficult outdoor audio, waterproof PA, or weatherproof speaker project today. Swimming Pool, touring sound, ship board, or anywhere – if you need high quality sound-reinforcement gear that can operate in wet, rainy, snow-covered environments, even at IP56 levels, Technomad is the right choice. Note that Technomad also makes 70-volt versions of all of our products – these feature high-performance transformers with excellent frequency response and high power selections – so you can get ‘low voltage’ performance out of your 70-volt installation. Technomad also manufactures complete, ready-to-use PA systems for mobile use and permanent installation. These are ideal for sports facilities, outdoor paging, football stadiums, multi-use areas, restaurants, retail spaces, training centers and more. The PA systems feature Technomad’s fully-weatherproof loudspeakers and everything else you need – i.e. a pre-wired control rack with amplifier mixer / amplifier, microphone, wall-mount brackets and tripods, and speaker cables. All you have to do is attach the speakers to the provided cables, plug into your wall AC outlet, and you are up and running! Technomad also makes the worlds best IP66 waterproof amplifiers – built into NEMA enclosures, these weatherproof outdoor amplifiers let you put your amp in harsh conditions – no equipment room required. Finally, we make a useful mp3 player-recorder called the Schedulon – it’s a hardware mp3 recorder / player with instant playback (like a rackmount mp3 player) and also with automatic mp3 playback – on a schedule you set. Great for playing church bells, theme park sound effects, corporate event audio, airport announcements, school bells, and much more. The Schedulon is an easy to use mp3 player recorder with auto mp3 playback.